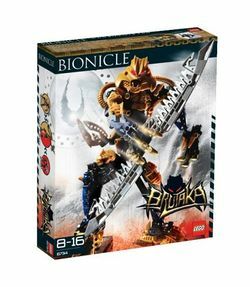 8734 Brutaka is a BIONICLE set released in 2006. Brutaka was released in mid-2006 as a large-boxed set. He contained 193 pieces. He and the other 2006 Titans were the first to revolutionize the new shin braces, using the new ball-joints and a piston for added support. 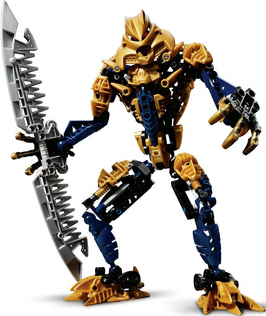 Brutaka's parts could be combined with those of Axonn to build Botar, whose instructions could be found on BIONICLE.com. The pieces from Brutaka, Axonn, and Vezon and Fenrakk could also combine into the Kardas Dragon using either the instructions on BIONICLE.com or those packaged with the parts of the three in a special edition Kardas Dragon set available only at Target or a LEGO store. Originally a lieutenant and soldier under the Brotherhood of Makuta, Brutaka grew weary of the regimented lifestyle and left. He was recruited into the Order of Mata Nui as something of a warrior-scholar, known for his abilities in both analysis and sword-fighting. After a series of problem-solving - and problem-causing (such as when he teleported a Tahtorak from its home island to the city of Metru Nui for fun) - adventures, Brutaka was teamed with his friend, a powerful and famous warrior named Axonn. The two were posted near the village of Voya Nui to serve as the Kanohi Ignika's first line of defense. At the same time, they also secretly protected the region's Matoran. Brutaka and Axonn survived the Great Cataclysm and the resulting earthquake that tore Voya Nui and the surrounding area from the Southern Continent and sent it rocketing up to the surface of the planet; however, Brutaka was shaken by the event and grew convinced that Great Spirit Mata Nui had either died or else abandoned the universe. Although Axonn argued that Mata Nui had only lapsed into a coma and would make all things right when he reawakened, and although Brutaka continued to perform his duties, his heart was no longer in his work. When six evil Skakdi calling themselves Piraka came to Voya Nui in search of the Ignika, Brutaka aided them, dispatching the six heroic Toa Nuva and the Voya Nui Resistance Team with a single blow from his Rotating Blades and defeating Axonn in at least two conflicts. All the while, Brutaka's stated purpose for abetting the Piraka was his intent to betray them all and take the mask for himself. During a battle with the newly created Toa Inika, however, two Piraka named Hakann and Thok stole Brutaka's powers with a gold-coloured Zamor Sphere that contained a portion of Vezok's ability to absorb a foe's powers. Brutaka's powers were returned after another special Zamor Sphere hit Hakann and Thok. Almost immediately upon reviving, however, Brutaka engaged Axonn in single combat. During the long and fierce battle, Brutaka summoned an interdimensional portal to teleport Axonn to the Zone of Darkness and revealed the extent of his fall to his former friend. Upon hearing this sad revelation, Axonn flew into a towering rage, defeating Brutaka and knocking him unconscious. At that moment, Botar appeared, taking the defeated Brutaka to The Pit despite Axonn's protests. Brutaka's interdimensional portal was used by Krahka and Tahtorak to escape the Zone of Darkness. By the time he awoke, Brutaka had already been mutated by the Pit Mutagen to breathe underwater. He swam into a cave, which was revealed to belong to the Barraki, warlords who had been condemned to the Pit ages ago. Upon hearing of the Ignika's appearance in the Pit from the Barraki, Brutaka formed an alliance with the warlords and demanded to be taken to the Ignika. After failing miserably in an attempt to convince the Barraki and a Matoran named Dekar that he was in fact a member of the Order of Mata Nui (which they had never heard of anyway), Brutaka was captured by one of Kalmah's Giant Squid and disappeared into the Black Waters of the Pit. Brutaka eventually killed the squid. Due to the mutagen, his transformation accelerated and his physical appearance started to change. He happened upon Teridax, the Makuta of Metru Nui, in the body of the robot Maxilos, attempting to recreate the Nui Stone with the Staff of Artakha and defeating Matoro who was attempting to stop him. Recognizing a little bit in himself in Teridax's evil actions and feeling disgusted by what he saw, Brutaka intervened, attacking the master of shadows and snatching the Staff. He then called on Botar to teleport the Staff away; when Teridax threatened him with the loss "of everything," Brutaka simply laughed at the notion that he had anything left to lose. After ordering Matoro to return to the other Toa Mahri, Brutaka fought the Makuta to a stalemate and ended the battle by informing his foe that the Ignika was in the hands of Hydraxon. Forced to break off the engagement by this news, Teridax left, but not before informing Brutaka that their fight wasn't over. Brutaka was at one point rescued from the Pit by the Order of Mata Nui and given a breathing apparatus so he could survive on land again. He was also declared a probationary member of the Order. Soon afterwards, Brutaka went to Metru Nui with Helryx and Krakua, where he shrunk a sundial and gave it to Krakua, who in turn gave it to Takanuva. He then captured the Dark Hunter Dweller, and brought him to Helryx, who later transported him to Daxia. He also attempted to use his Olmak to send Takanuva to Karda Nui, after Takanuva was told that Brutaka would be working with the Toa Mahri to protect Metru Nui in his absence. However, slight damage to the mask from the Pit resulted in Takanuva being sent to another dimension instead. Soon afterwards, Helryx approached him with a new proposal, one with the potential to restore his status in the Order. As the Order of Mata Nui began to openly engage the Brotherhood of Makuta in combat, they turned to Brutaka to lead a team in what could potentially be a suicide mission against the Brotherhood; to rescue their former leader, Miserix. The team consisted of the insane Skakdi clone Vezon, the treacherous Vortixx Roodaka, the rogue Makuta Spiriah, the Dark Hunter Lariska and the Barraki Carapar and Takadox. The team headed to one of the southern island chains, where they were to attempt to find Miserix. When the team traveled to Stelt to purchase a boat for their travels, Brutaka bluffed using Roodaka as payment, due to the fact that the people of his homeland wanted her because of her involvement in Sidorak's death. Before he handed her over, he told Vezon to "lightly tap" the trader on the head so it would look like there was a fight. It was all a ploy, however, as Brutaka then knocked the trader unconscious and had Takadox hypnotize the beings on the ship and have them jump overboard so they could steal the ship. After he told the team where they were heading, a Zyglak fleet appeared under Spiriah's command, used his weather control power to hold the ship in place. Spiriah explained that he was taking the ship to Zakaz, so he could exact revenge on the Skakdi. For three days, Spiriah held his position, until they arrived at Zakaz. As the Zyglak armada was about to attack Zakaz, they were ambushed and all of the ships sunk. Brutaka then attacked Spiriah, knocking him down, and revealed the final member of their team. Brutaka had ordered Lariska to follow the team after they left Stelt, and had also instructed her to make contact with Ehlek's species that dwelled around Zakaz to destroy the Zyglak ships. Brutaka regained command of the team, and they continued on their journey. Later, they arrived at an island where weapons had been stored by Brutaka's fellow members Botar and Trinuma, at the cost of Botar's life. After Brutaka had distributed the weapons, the group was attacked and Brutaka taken by the legendary entity Tren Krom. After failing to learn of the current status of the universe from Brutaka's well shielded mind, Tren Krom turned his attention to Lariska, probing her mind with more successful results. After killing Carapar, who had assaulted the crimson being, Brutaka was discarded in Tren Krom's rage, and permitted to escape along with the rest of his team. They returned to their boat, and resumed their mission. Before arriving on Artidax, Lariska expressed a concern for Takadox, but Brutaka brushed it aside as nothing. When they arrived, Brutaka and Spiriah disembarked first, the latter setting off a trap sensitive to Makuta, and was almost taken underground and suffocated by the living sand. Brutaka, unable to pull him free, had Roodaka launch a Rhotuka at the sand, transforming it into Fireflyers. Spiriah attempted to leave, but Brutaka convinced him that if he stuck to the mission and they succeeded, Spiriah stood a chance to gain ultimate power as leader of whatever remained of the Brotherhood. Lariska later approached Brutaka, knowing that his claim was a lie, but Brutaka insisted it was the only way to distract him from the fact that he may perish in the course of the mission. The team continued on, with Spiriah as their guide to set off any possible traps so the others could avoid them. Nearly stepping on a vine and setting off a trap, Vezon stopped him, and they entered the only passageway through the island. Upon entering the tunnel, Brutaka realized that Takadox was missing, only to find the treacherous Barraki severing the vine rigged to set off a cascade of boulders, thus trapping the others inside the tunnel. After the team recovered, Brutaka convinced the team to continue instead of trying to free themselves. On the way through, Brutaka explained a little of the history of Artidax, and how it is normally a raging volcano, but Tahu and Kopaka had since quelled it, as part of their own mission. After leading the team across a bridge, Roodaka questioned Brutaka's motives in wanting Miserix. Brutaka explained that his employers needed him as a tool, a weapon to use against the Brotherhood. Ignoring Vezon's ramblings at first, Brutaka eventually noticed that thousands of insects had gathered in the chamber the were in, penning them off from escaping or going forward. After forcefully convincing Spiriah to try and control the insects, the Makuta failed in his attempts, revealing a much more powerful will than his own behind the insects. Roodaka again used her Rhotuka to escape the chamber, mutating the insects so they fought amongst each other, creating a large opening which the team rushed through, into Miserix's chamber. After warning Vezon not to comment, Brutaka noticed the Klakk flying around the chamber. Confronting Miserix, the titan asked him who he was, with Brutaka claiming that he was there to free Miserix. Vezon then interrupted, but was blasted with heat vision by an annoyed Miserix. After Miserix absorbed Spiriah, Brutaka presented him with three options: stay, be killed by the next volcano eruption, or come with them. Lariska pointed out that the chains holding Miserix used his own power to contain him, and Brutaka ordered them to be broken. After finding the weak link, Brutaka and Roodaka fired at it until one of the chains broke, causing the Klakk to attack the team. Brutaka parried the streams of sound they created, until Miserix freed himself from the other chains and unleashed a power scream upon the Klakk, knocking them, Lariska and Vezon unconscious. Brutaka denied Miserix the knowledge that he wanted, and instead requested for the former leader to shrink to an appropriate size. Amused, Miserix broke the side of the volcano so that he could escape, and keep his size. After Roodaka failed to convince Miserix to be her ally, Brutaka loaded the rest of his team onto Miserix's back, who had since sprouted wings, and had them exit the chamber, flying north. Brutaka took the team to a barren island for unknown reasons. He then had Miserix continue on to Daxia, where he was told by Helryx that the Order was coming out of hiding. He soon after passed this message on to Axonn after he had been brought to Daxia as well. In "The Kingdom" Pocket Dimension, Brutaka survived the end of the universe, and wound up in the Kingdom of the Great Spirit. Takanuva later sought him out to re-attempt his journey, but instead ended up in yet another pocket dimension. In the Toa Empire Pocket Dimension, Mata Nui had never fallen asleep, and thus Brutaka had never lost his faith in him. However, while on Voya Nui, Brutaka was confronted by Toa Bomonga, Gaaki, and Pouks. While he was distracted by Gaaki and Pouks, Bomonga struck Brutaka in the back and killed him. His Olmak and Rotating Blades were then taken and stored in the Coliseum. Takanuva had planned to find Brutaka to return to his own dimension, but before he could, Teridax, Kojol, and Krika told him to retrieve the Vahi from Jaller before they would help him find Brutaka. When Takanuva found Jaller, he also met Bomonga and Kualus, who were escorting the Matoran, and he learned from Bomonga of Brutaka's fate. Brutaka is extremely powerful, almost on the level of a Makuta, and possesses a wide range of abilities. Below is a list of the powers he is known to have; it is entirely possible that there are more abilities that he has but has never been seen to use. He is extremely strong, able to knock six weakened Toa Nuva and six Matoran unconscious with one swing of his blade. He can fire powerful blasts of energy from his blades or hands. Like all Order of Mata Nui members, his mind is shielded against telepathy and mental attacks through years of training. Due to a strange quirk of his species, he becomes more powerful when he absorbs Antidermis, and has a slight natural resistance to the Pit Mutagen. He can dissipate stasis fields. Due to the Pit Mutagen, Brutaka gained the ability to breathe water. However, he also lost the ability to breathe air and wears a breathing apparatus in the shape of a domed helmet that allows him to breathe air to survive on land. Also due to the mutagen, he now has spikes jutting from his armor and what looks like a dorsal fin on his back. Brutaka wears a Kanohi Olmak, the Mask of Dimensional Gates. The mask allows him to open portals to other places, including pocket dimensions attached to the BIONICLE universe. These portals are so powerful that they can stay active even if Brutaka is unconscious, and only disappear once something passes through them. However, the mask is now slightly damaged by the Pit Mutagen, and it is harder to control. He also possesses two Rotating Blades, swords that produce a powerful electric current if someone other than him tries to hold them. Additionally, two Protosteel throwing knives are hidden on his back. This is a description taken from LEGO.com. Please do not modify it. (see an archive of the product's page) Dark master of dimensions! Once he was a loyal guardian of the Matoran and Axonn’s best friend, but now he has turned evil! Powerful enough to defeat six Toa with one blow of his double-bladed weapon, Brutaka alone is as great a threat as all the Piraka combined! He wears the Kanohi Olmak, the Mask of Dimensional Gates, which can be used to transport a target to another location or even into another dimension! Brutaka stands over 10" (over 25cm) high! Includes gold-colored armor and elements! Double-blade is 10" (over 25cm) long! Includes Mask of Dimensional Gates! Book author Greg Farshtey stated that Brutaka was actually lost, not evil, during the time that he was in the Pit. Brutaka's hunger for the power provided by the Antidermis virus after his first exposure could be considered a psychological addiction, albeit one he could control. This page was last edited on 28 April 2016, at 18:02.